This is an offering of a three-bedroom villa located in Benaulim, close to the beach. The villa is located in a secure and gated complex and is surrounded by landscaped gardens. Inside, the villa is compact and furnished with simple cushioned cane seaters, a small wrought-iron six-seat dinette, a functional kitchen with a gas stove, a toaster, an electric kettle, and a refrigerator. The bedrooms are simple yet comfortable, with wrought-iron double beds and dainty side lamps. The rooms open out into balconies that overlook lush greenery that is soothing to the eyes. The villa consists of well-appointed living spaces with amenities like cable TV, air-conditioner and capacious bedrooms with en suite bathrooms that have modern fixtures and constant supply of running hot and cold water. The bedrooms also have king sized beds, cushiony mattresses , wardrobes, bedside tables and a dresser. Large windows allow ample ventilation in the rooms. There is also a fully equipped kitchen that enables guests to enjoy self-made food even during a vacation. 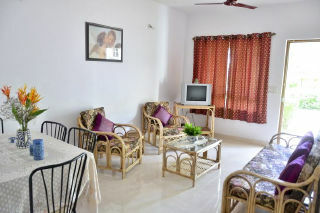 All equipment and appliances like refrigerator, microwave, cooktop, kettle, crockery and cutlery are available. There is also a dining area where guests can enjoy their meals. Guests are requested to provide valid identification at the time of check-in House Keeping is chargeable.